In light of our ‘Big Freeze’ and subsequent ‘Rain-out flood risk’, the roads in Ireland have gone to sh*t. I’m worried particularly about the stretch of the Duncannon Line between Kate’s Farmshop and The Mountain Bar pub, as that’s the stretch I drive every day, no matter where I’m going. The only way to avoid cracking a tire open is to drive in the middle of the road, straddling the white line, which might be possible at 3 o’clock in the morning but not so much at 3 in the afternoon. Now I don’t know a lot about road-filling or surfacing or anything like that but surely, there’s some way of filling this serial offender so that it stays gone for slightly longer than three weeks at a time? Because it takes almost a month to get them to fill the bloody thing again. Better again, why not simply resurface the road? Ha ha. Good luck. I was told recently that Wexford has the worst record for time between road resurfacing. It’s currently something like 25 years. But we shouldn’t feel bad, we’re probably not beating the others by much. Except South Dublin of course, which probably gets resurfaced every time the bankers need to take the Merc to Donnybrook for a rugby match. Well put there! 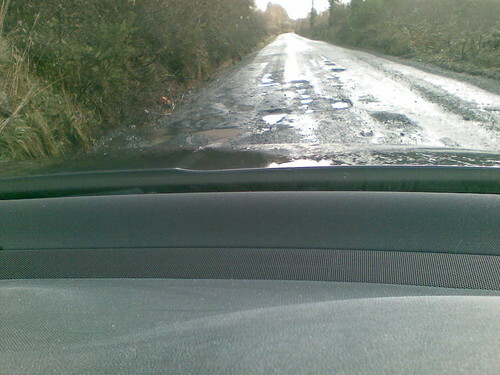 Throughly enjoyed the discription of Irelands strategy in filling in the pot holes!! I thought that the Irish were the best in the World -sure weren’t all the London and New York roads built by the Irish? – for building and fixing roads, that is. There is one beauty on the road to Shelmalier Stables past our old house. I am sure it is there today! It was filled every year about this time of the year by a fella pouring tarmac into the hole and another fella jumping on top of the stuff to flatten it!!! This is true! Now France is another thing all together brill for bike riding. Sorry Ireland but facts are facts! !